"Festivals of the World" is an educational series by Mike Ghouse developed in 1993. When we live as neighbors and in the same communities, we might as well learn about each other. The best way to build cohesive societies is for members to participate in festivities as well as commemorations of each other, or at least understand each other's joys and sorrows. Please note, the simplicity in writing is designed for people of other faiths to learn and to know, so we can function cohesively. The Festival of Hanukkah is a Jewish celebration, and it is about celebrating the recovery and re-dedication of the Jewish Temple in Jerusalem in 165 B.C. Hanukkah is spelled in many different ways in case you want to Google it; Hanukah, Chanukah, Chanuka, Hanukka and other variations. 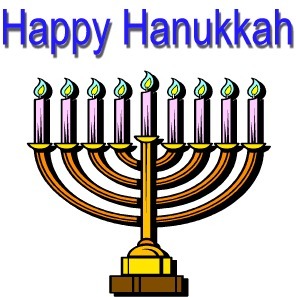 Hanukkah is celebrated for eight days and nights. It is also called the festival of lights. It starts on the 25th of the Jewish month of Kislev each year, and the actual date differs every year due to the lunar calendar. It is about 11 days earlier in each successive year. Like Jews, Muslims and some Hindus also follow the lunar calendar for their holidays. This year the festivities will begin with the lighting of Menorah on Wednesday, November 27th and will continue thru December 5, 2014. Rabbi Michael Lerner writes the essence of Hanukkah in Tikkun Olam. "It is the holiday celebrating the triumph of hope over fear, light over darkness, and the powerless over the powerful." He went on to say that Chanukah is about "understanding that when we connect with the transformative power of the universe, the Force of Healing and Transformation, YHVH, we become aware that the powerless can become powerful, that oppression of any sort is in contradiction to the fundamental nature of human beings as loving, kind, generous, free, creative, intelligent, attuned to beauty, caring for and needing each other beings created in the image of God. When that energy and awareness permeates our consciousness, no ruling elite and no system of exploitation can possibly last for very long." Here is how it began. The Jewish people have been persecuted by one zealot or the others over the last three millenniums; the point of no return came when they were ordered to bow down to an idol and eat the flesh of a pig - the most forbidden acts in Judaism. The High priest of the time Matthias refused to do that, a villager stepped in and wanted to perform the act to save the Jews, at which time, Matthias pulled his sword and killed the villager as well as the Greek Officer. That led to a revolt and the rebels known as Maccabees joined him and eventually took their land and the temple back from the Greeks. Then they went about purifying the defiled Temple in Jerusalem by burning the ritual oil in the Temple's menorah. They were shocked to find out that the oil was good for just one day; they lit the menorah any way and were surprised to find that the oil burnt for full eight days. It was a miracle, and the Jewish people continue to light the menorah, termed as hanukkiyah for eight days. On the first night of Hanukkah, one candle is lit, two on the second and all the way to eight on the eighth day. Thus the tradition continues. America is an amazing land that Americanizes every faith and tradition. The Jewish parents in the United States receive gifts for Hanukkah, probably one for each night. Muslims, Hindus, Buddhists and others have figured out a way to keep their children in the joyous mood of receiving gifts, so they have their own version of Christmas. Every festivity is accompanied by food and activities. Hanukkah has its own like lighting the hanukkiyah, spinning the dreidel and eating fried foods. Our happiness hinges on the happiness of others around us, and it is in our interest to be a part of the whole.